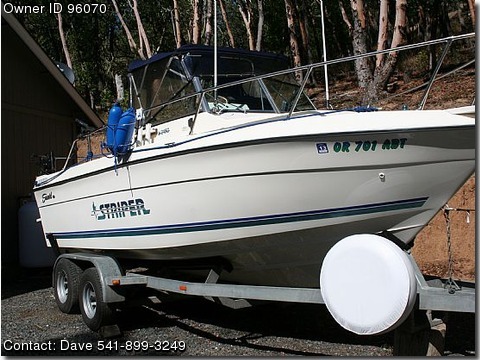 Call Boat Owner Dave 541-899-3249 541-261-5077.Description: Meticulously maintained, many upgrades, including, new 2012 Raymarine A57D fishfinder/Chartplotter GPS, 2012 Raymarine VHF radio. Also included 2 Cannon Magnum downriggers. rod holders, 2012 Stereo, full canvas, Bimini top, carpet, Coast Guard pack, compass, storage, dual batteries. Trailer is galvanized, has recently had new bunks with all stainless hardware, and is equipped with disc surge brakes. Tires and bearing were new last year. The engine is a fuel injected 5.7L and has very low hours since being pulled and had an upper engine overhaul, including new exhaust manifolds and risers, and all hardware replaced with stainless. Rear bait tank with aerator pump, wash down pump, dual anchors and much more. It is ready to fish and runs beautifully.